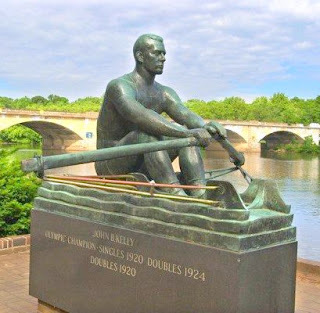 The scandalous rumor that Philadelphia sculler John B. Kelly mailed his jock strap to King George V after his double Olympic victories in 1920 is considered apocryphal everywhere else. But locals just smile and keep the city's secrets. Kelly, father of actress Grace Kelly, later Princess of Monaco, had been refused entry in the 1920 prestigious Henley Royal Regatta in Britain partly because their rules excluded anyone "...who is or ever has been...by trade or employment for wages a mechanic, artisan or labourer." Kelly, who had worked on summer breaks in his millionaire father's bricklaying business, hadn't even planned to enter the Olympics that year, but handily took two gold medals, narrowly beating out the Henley winner. The public outcry on both sides of the Atlantic made the Henley Committee reconsider its rules, and John's son Jack later won the Henley Diamond Sculls in both 1947 and 1949. Sculling and stories about it have been popular in Philadelphia since the first rowing clubs opened along the Schuylkill River in the 1730s. So despite Sister MM giving it two thumbs down for excessive domesticity, I enjoyed Deborah Crombie's No Mark Upon Her, although I agree that there was more birthday party than necessary. DCI Rebecca Meredith of West London Serious Crimes Division had been reckoned a strong Olympic contender at university, before a broken wrist took her out of competition. Twenty years later, she is considering taking a leave of absence to resume her athletic career. Her demanding day job often defers her training time until very late, sometimes after dark. One night she doesn't return, and London K-9 River Search and Rescue members find her murdered body the next day beside her smashed scull. Primary suspects include her financially strapped ex-husband; her lover, an Iraqi war veteran suffering from PTSD; and another high-ranking Met officer against whom she was secretly building a case of multiple rapes. But several younger members of the Leander Rowing Club are bitterly resentful of the time that their coach spends training this talented older woman, who may be chosen to replace one of them in competitions. DCI Duncan Kincaid has his hands full with this twisted political hot potato and media circus of a case, whose resolution blindsided me completely. Across the pond in Philadelphia, therapist and single mother Zoe Hayes is persuaded by a friend to take a double scull out after dark in Merry Bloch Jones's The River Killings. When one of Susan's oars snags on something, the scull rolls, dumping the women into the river. Zoe surfaces and clings to the overturned boat, uncomfortably close to the body of the woman whose skirt had snagged the oars. And she can't find Susan. She dives, finds a limb, and pulls, dragging Susan to the surface, only to find that it is not Susan. Or is it? It's so dark! A moan from the other side of the boat assures her that Susan is alive. Suddenly the river seems to be full of tangled, matted masses of floating bodies. The horrified Zoe counts 13 in the spotty moonlight before they get the boat righted. Zoe's lover Nick Stiles is the homicide detective assigned to the case. The 19 bodies of Asian women they recover appear to have been immigrants who suffocated, quite possibly in the back of a truck or van during transport. Many show chafing from manacled wrists, and all have three wavy scars slashed across their faces. As the FBI moves in to take over the case, Zoe and Susan are accosted and questioned, first by a priest and an old woman, and then by a dubious solo FBI agent. Zoe is sure she is being followed, and when her house is broken into and every picture of Nick defaced, she begins to wonder who she can trust. As in Crombie's book, a lot of Zoe's time is spent in the minutiae of domesticity and child care, which becomes very tiresome after awhile. 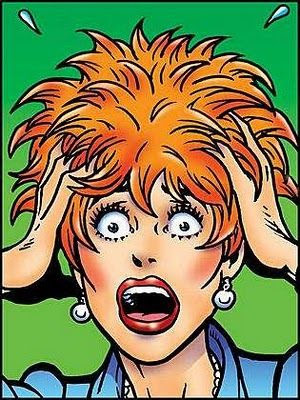 What is this new trend among authors to imagine that readers are interested in pages and pages of excruciating details of domestic disasters and tantrums? Many of us read mysteries specifically to escape those daily hassles for a little while. While the information about rowing and the descriptions of the city in The River Killings were accurate and interesting, the story itself––unlike Crombie's––was rather weak. Despite these flaws, I was hooked after the vivid nightmarish scene in the river that opened the book, and will likely try another in the series sometime. But right now, it's time for some tricky but happily undomesticated detection. Any suggestions? Enjoyed this post, Peri. How about Christopher Fowler's THE MEMORY OF BLOOD? I just finished this Peculiar Crimes Unit book, and it's both dark and entertaining. I'm looking forward to reading Colin Cotterill's KILLED AT THE WHIM OF A HAT, the first in his new series. Judith, aren't mystery writers inventive? I sometimes wonder if any of them ever turn to crime, or if they write out all of their murderous urges. Georgette, killed at the whim of a HAT?? The sorting hat from Harry Potter run amok? I don't think I've ever read Fowler, but it sounds interesting. Thanks.